That’s a snippet of advice that Aby offers in her Organizing with Your Kids instant download class. 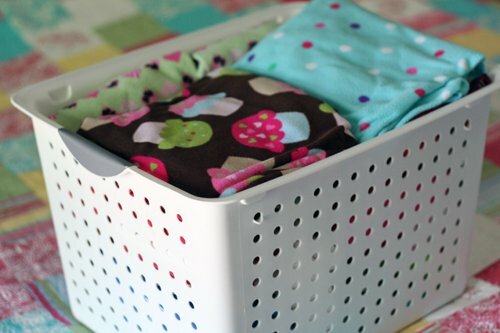 It sounds so simple, I know, but it’s one of those things that rocked my organizing world! I honestly had never even considered this. Purging clothes that might possibly be worn at some point in time by some member of my family? Preposterous! Since my children were born, I have wrestled with large bags of hand-me-downs, storage tubs, and overstuffed closets and drawers. We are so fortunate to have such an overabundance of clothing, I know, particularly since most of it comes to us second-hand. But I can’t tell you how many times I’ve received an article of clothing for the girls, immediately disliked it or knew that neither daughter could/would wear it. Would I purge it? No. I would stuff it in with the other things…just in case. Recently, I discovered why I do this. I was talking with my mom about her frustrations with a small clothes closet. She commented that she ought to just get rid of the majority of her clothes because she doesn’t wear them. She thought for a moment before realizing she doesn’t actually know why. It simply feels wrong to her to get rid of perfectly good clothes. Maybe you’ve been there, too. I know I have. This simple conversation was such a light bulb moment for me! My holding on to hand-me-downs (and other things for that matter) is how I was raised! It makes so much sense when I think about it, too. My parents were born at the tail end of the Great Depression, and that experience shaped them. They would regularly wear clothing and shoes that didn’t fit, much less feel comfortable or reflect their personal style. They had large families, and clothing items were passed along, mended and repurposed until they literally became rags. But my family is very fortunate, because those are not the circumstances we are living with. Aby’s advice from the class, along with the understanding of why I’ve held on to clothes that we won’t wear, has had a terrific impact. First, I have become more realistic about what will or will not be worn by the children, my husband, or even me! Second, I have freed myself from the feeling that it’s wrong to get rid of good clothes. Instead, I’ve realized quite the opposite. Just because we won’t or can’t wear something doesn’t mean someone else won’t. I have always sought out other children to hand down to, participated in clothing swaps, and donated to charitable organizations. But now, clothes that are really just clutter in our home move on to find a new happy home sooner rather than later. Third, it’s great to create breathing room in the closets and drawers. I love the discovery that I didn’t actually need more storage in the kids’ rooms. I just needed less clothing clutter! How about you? Do you have kids’ clothing clutter or clothing clutter of your own? Have you held onto things in the past, simply because it felt wrong to let them go? How do you feel about reconsidering this belief? We’d love to hear from you. I struggled with getting rid of clothing, either mine or my children’s (both new and hand me downs). My mother almost never gets rid of her clothing, which is where I got it from, until it hit me. I was taking up precious space in our house with clothing that I didn’t wear and my children had out grown, when there are so many people out there who could use the clothes. While I only have a few things at a time, I had kept ALL my children’s clothing, from baby to size 4! They were all in acceptable or perfect condition. So I kept only pieces with very special significance (eg: an outfit worn at their christenings) and donated the rest. It gave me so much satisfaction to think that the op shop either sold some of them (very cheaply) or sent them to their charity in an underdeveloped country for children with nothing. I now had extra space in the house and my mind also felt less cluttered. Now I look forward to the end of seasons just so I can clear out our closets! Once I tackled the hurdle of being willing to get rid of things I struggled with finding the perfect person or place to donate my items to. I have been known to sort things out and take some stuff to the women’s shelter, some to the homeless shelter, some to friends’ kids, some to the children’s center, Goodwill, etc. I have finally come to the conclusion that it doesn’t matter where it goes – someone will be blessed by it. A drop off center for a large charity resale shop recently opened in my town and I think the employees must be wondering how I can be in there so often! It feels so good to drop things off, and once out of sight out of mind, and nothing has been missed (or even remembered). I still have a few things piled up that I just have to look at for a while before being willing to part with them, but they will meet the same fate soon. Thanks for the motivational and inspirational postings – they do help! Great article. I’m not one to hold onto things but what a great way to let everyone know it’s ok to finally let go of things. There are so many out there that can use help these days so donating or even asking around to see if someone can use items in your neighborhood. Have a great weekend. I’ve recently had that same epiphany! When packing winter clothes away, if I didn’t wear it (this year or last) it went into a pile. I tried everything on, and if it fit AND I would wear it, I kept it. Regardless if it fit or not, if I had no intention of wearing it, it’s in a pile to be donated this week. And as I UNpacked spring/summer clothes, I did the same thing. I only kept 1 skirt, 2 dresses and 2 pairs of pants that don’t currently fit (because they did last year and will again this year!). If I didn’t wear it last summer, or if it didn’t fit, or if it did and I just didn’t like it anymore, it’s going away this week! There are many people out there who could use these clothes, most of which are in mint condition… It feels wonderful! I feel lighter already!